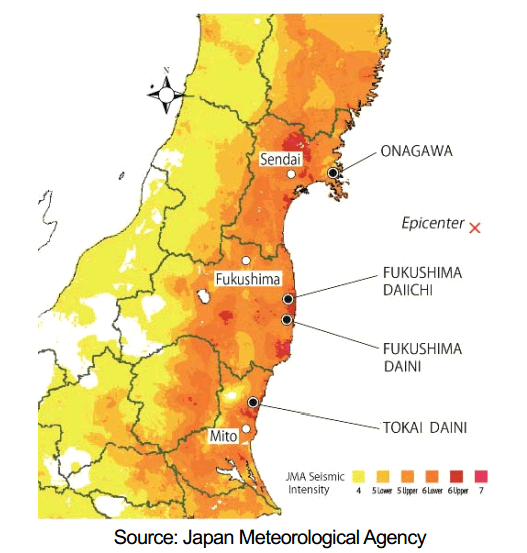 A paper published by the Japan Atomic Industrial Forum focuses on why Fukushima Daiichi experienced a severe accident and other nuclear power facilities like Fukushima Daiini, Onagawa, and Tokai nuclear power plants were not as severely affected by the earthquake and tsunami. One of the findings was that the earthquake damaged all seven of the offsite power systems providing external power to the Fukushima Daiichi plant. Most of the offsite power systems at the Daiini plant, the Onogawa plant, and the Tokai plant were also destroyed and the Forum advises that the reliability of all power sources including external power sources should be improved. If workers at the Fukushima Daiichi nuclear power plant were capable of receiving offsite power they would have had many more emergency actions available to them to prevent a meltdown of any of the reactor cores. The report also documented the effects of the tsunami which knocked out the emergency backup diesel generators at Fukushima Daiichi. The Fukushima Daiini plant also lost its emergency seawater cooling pumps due to the tsunami, but was able to cool all four reactors with offsite power from the one remaining offsite power systems not damaged by the earthquake. At the Tokai plant, although offsite power was lost, emergency diesel generators were still available and charged batteries that powered the reactor core isolation cooling system. The Onagawa plant did not lose offsite power and the tsunami did not affect the main buildings onsite.